Much of life is about how we get on with other people. We move through life more effectively if we are able to connect and communicate well. Of course, all this would be a lot easier if everyone else was like us, right? Reading People is a highly practical system for quickly determining the type of person you’re engaging with and how to get the best out of that interaction. You will discover methods to communicate with people in ways that they will respond to positively and just as importantly, how to avoid pointless misunderstandings. This is a powerful way to deeply understand yourself, to become aware of some of your blind spots and also to celebrate your innate strengths. Reading People is also a template to understand the dynamics of a team, in terms of exposing the patterns that different types of people naturally adopt when they interact with other types. It’s also a potent method of communicating with your clients in easy and effective ways, by speaking to them in their language. Totally bespoke, highly interactive, warm-hearted, thought provoking and wickedly funny. 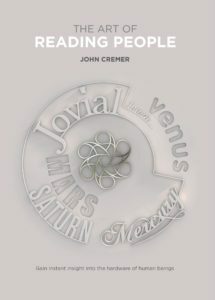 John Cremer’s keynotes bring to life the different people types which feature in his book, The Art of Reading People. The keynote is customised to the audience, in terms of delegate numbers, cultural references, nationality and perspective, making it universally accessible and applicable. John delivers keynotes on the subject of Reading People on every continent through a scheduled programme of tours. If you are interested in booking John for a keynote or a tour, please contact us as soon as possible so we can check availbility. A half-day workshop is a perfect introduction to the Art of Reading People. The session is entertaining, light-hearted and yet manages to press a few buttons. You’ll have lots of “A-ha” moments as you start to realise exactly who you’re surrounded by, and why they say and do the things they do! Fascinating, revealing, intriguing and will have you thinking for weeks and months. Book now, laugh and cry as you uncover your true organisation! A full, 6-hour workshop gives you everything from the half-day session plus plenty of time to take in the theories and start applying the model to yourself, your co-workers and your teams. By the end of the day you’ll be able to map the different types onto your people and work out the implications for your and your organisation. Find out more and book now. The Masterclass is the supreme practitioners package which will leave you being able to apply the Reading People process for yourself with a high level of confidence. Keep this option for your top teams who want to get even more competitive advantage! Book in stealth. Don’t tell anyone. Buy The Art of Reading People here.